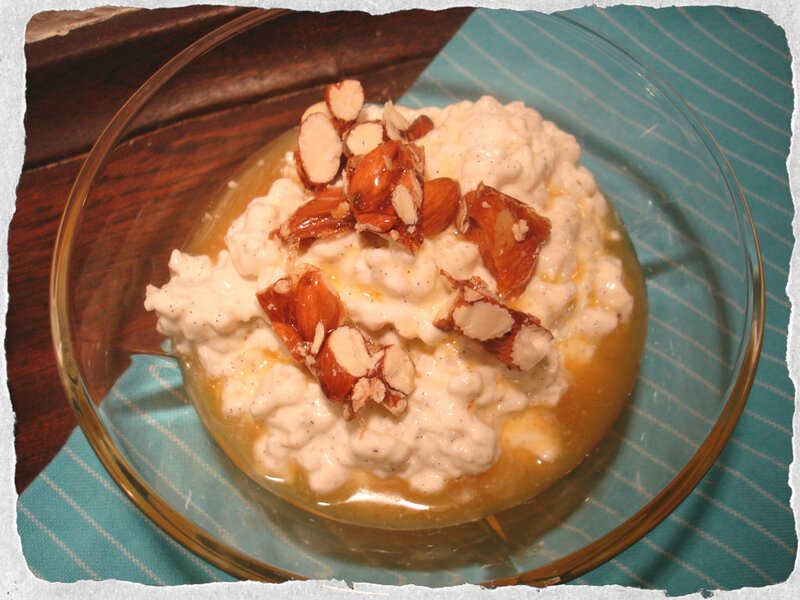 I found this dessert recipe on Valdemarsro’s blog last month. I looked and sounded so good, that I decided to give it a try myself. 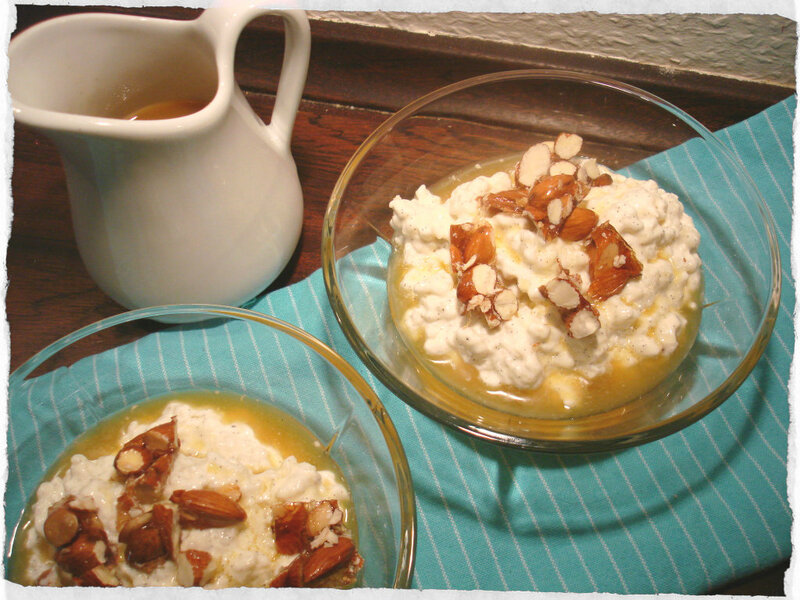 Traditionally Ris a ala mande is the dessert we eat Christmas eve or at one of out Christmas lunches during December. I don’t know why it is a French inspired name since it’s a Danish dish, maybe we wanted to be a bit fancy back in the 19th century when it was first served. 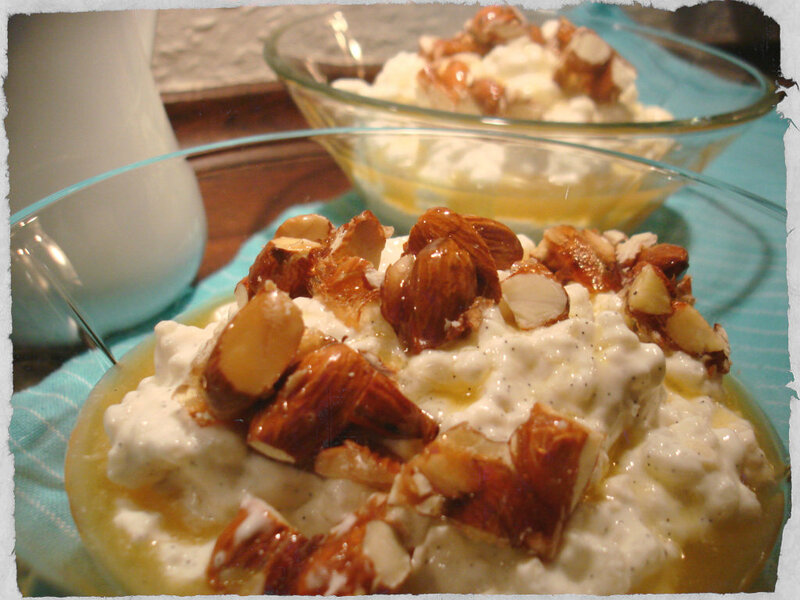 But fact is that it comes from the french riz à l’amande meaning “rice with almonds”. Cherry sauce is what we usually serve with it, so I thought that this orange sauce was a nice change. And crunchy honey glazed almonds are always delicious. I will continue to make the traditional dish on Christmas Eve, but this version is really really scrumptious, so I will definitely be serving it again, perhaps when we have a small group of friends over for a holiday get together. 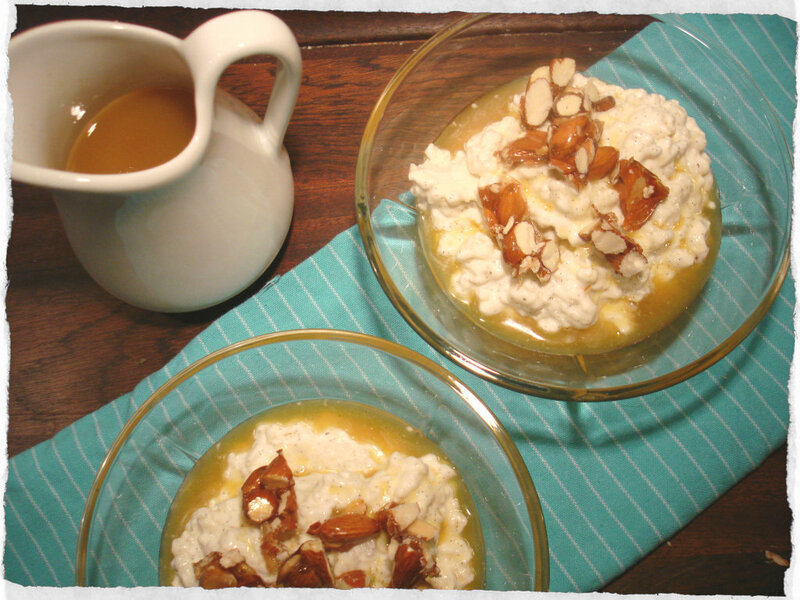 Take your left over rice pudding out of the fridge. Whip the cream to whipped cream. Chop the almonds very fine and toss both in the cold rice pudding along with the seeds from the vanilla pods and icing sugar. I like a lot of vanilla, so I often toss in a few teaspoons of vanilla sugar as well. Now fold the whipped cream in the rice pudding until it is all mixed well. Place in the fridge for a few hours before serving. Add Vanilla, sugar and the empty vanilla pod in a pot with the orange juice. Turn on high heat and let it cook for 10 minutes, so it boils slightly and becomes somewhat syrupy. Keep your eye on it so it doesn’t boil over. Reduce heat to low and let simmer for another 10 minutes. Strain the orange sauce through a sieve and add Cointreau. Serve either warm or cold, both are wonderful. Orange sauce can easily be made the day before serving. Add honey to a non stick pan and let it melt and start to bubble. Now you add the almonds to the pan and stir occasionally for about 5 minutes. Be careful they do not burn. They are done when they smell wonderfully nutty and you can hear then sizzle a bit. When they are done, pour onto a baking sheet, where they cool before roughly chopped and served on top of the ris a la mande. I am not quite in agreement with your method ! 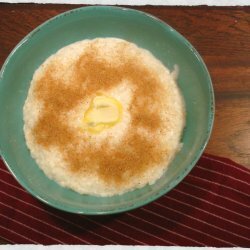 Traditionally, the rice is simmered in milk till all the milk is absorbed, sugar and vanilla is added and when the mixture is not quite cold, the whipped cream is added. This is how it is done in Denmark for an authentic ris a la Mande. And it is always served with cherry sauce. This is not a traditional recipe as I have written in the post, it is an alternative version I wanted to try out. 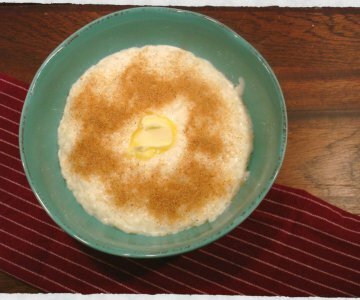 The way I make ris a la mande, is by cooking warm rice pudding and serving it with cinnamon sugar and butter – and then make ris a la mande with the left over rice pudding. And as a Dane I feel that it is very authentic. We all have our own way of making rice pudding in Denmark. And yes I also serve it with cherry sauce on Christmas Eve.